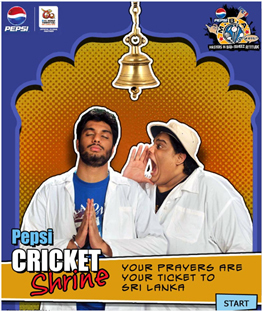 The cheeky Pepsi Cricket Prayer application on Pepsi India’s Facebook Page plays-up on the fact that cricket fans fervently pray for their team before crucial matches. It is a simple application but it’s the idea that works here. Pepsi is the official partner for the ICC T20 World Cup and is using its Facebook Brand page to engage its ‘YOUniverse’ fans with live commentary and cool applications. The brand has created a cricket themed extension to its ‘Change The Game’ campaign and is currently building on its ‘Masters in Bad-Tameez Attitude’ (MBA) promo. 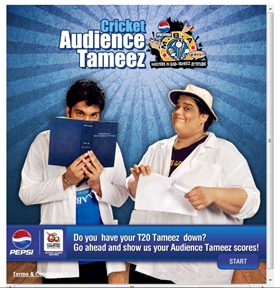 The CAT (Cricket Audience Tameez) application is a quiz that needs to be cracked in the shortest possible time. Winners get to watch T20 World Cup Live in Sri Lanka from the Pepsi Dug-out. 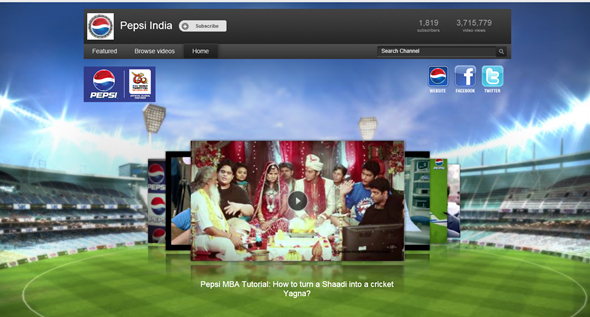 On Youtube, Pepsi has created exclusive, great quality video content called Pepsi Tutorials with Twitter Comic Stars and MBA Professors(!) @gkhamba and @thetanmay. The funny videos are worth a watch and there is fresh video content that keeps coming in as T20 World Cup progresses. The Youtube page also pulls in brand Twitter feeds. Let’s hope, for Pepsi’s sake too, that we win today’s match!